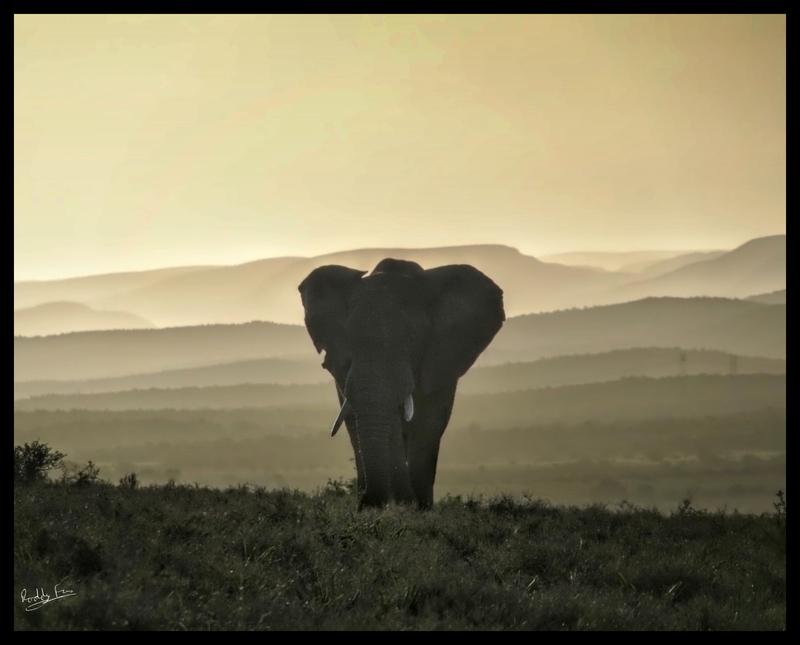 Last week we spent a day at Addo Elephant National Park and, just as we were leaving at sunset, we saw a lone bull elephant striding up over the horizon. The misty Suurberg ridges rising up beyond the Sundays River valley made a lovely dramatic backdrop to his silhouette. 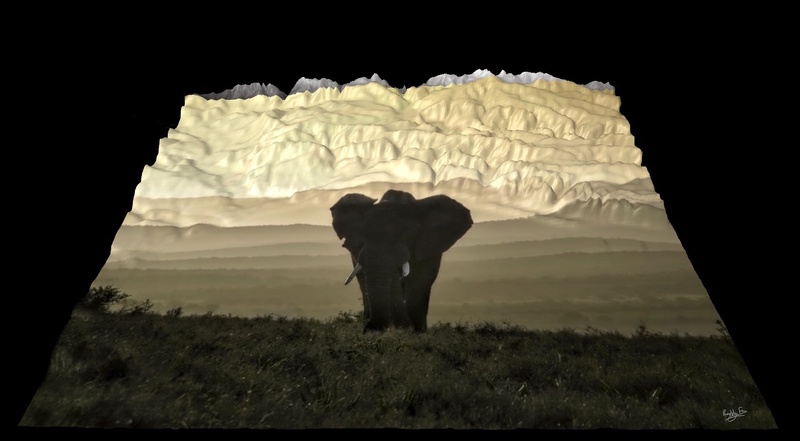 I got to wondering what would happen to my picture if I draped it like a tablecloth over a three dimensional elevation model of the Addo area – showing the elephant embedded on the landscape it lives in. It wasn’t easy to get the image looking aesthetically pleasing and on the right part of the landscape but here’s the result. 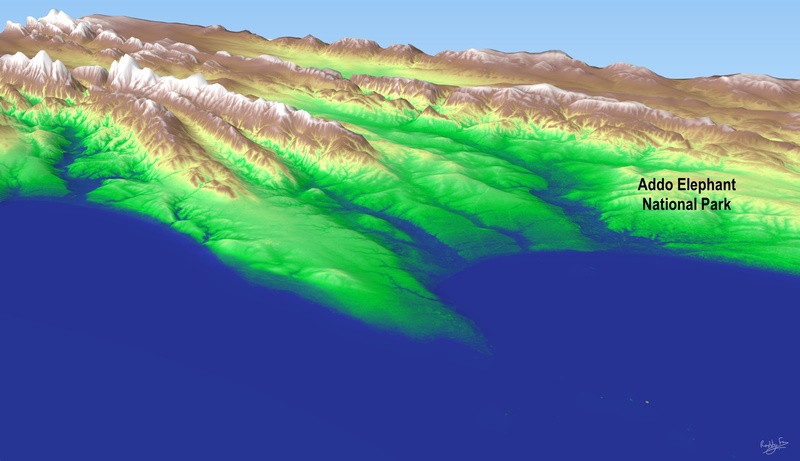 It’s coincidental because I was also using my geographical skills last week working with a 3D model of the Port Elizabeth area. I suddenly wondered if I could get something much more evocative using the elephant picture instead! 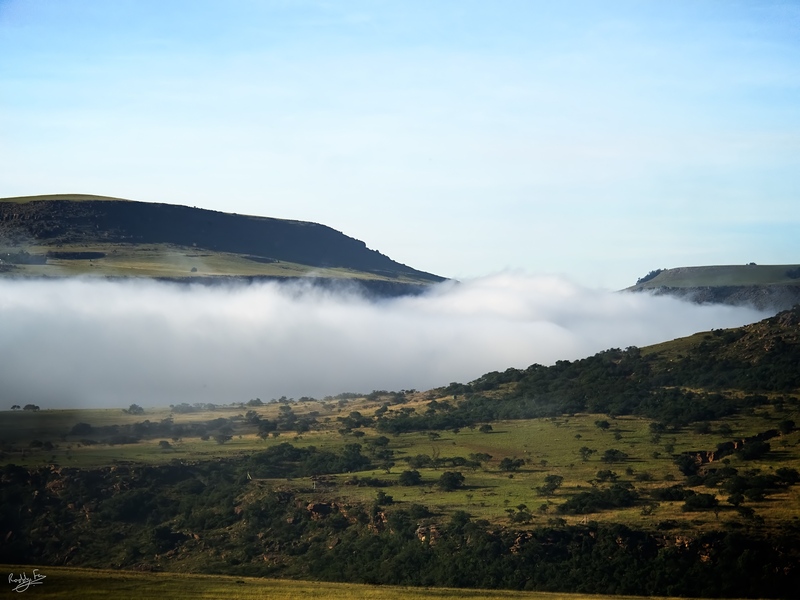 There will probably be autumn mist tomorrow morning, our host at Tsitsa Falls backpackers (Adrian Badenhorst) told us around the camp fire, you often get them when a hot day follows. He was right. 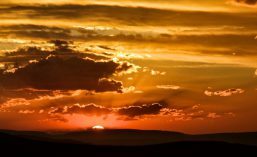 The whole Tsitsa valley was dark with mist at sunrise but it soon began to clear as the sun burned through. 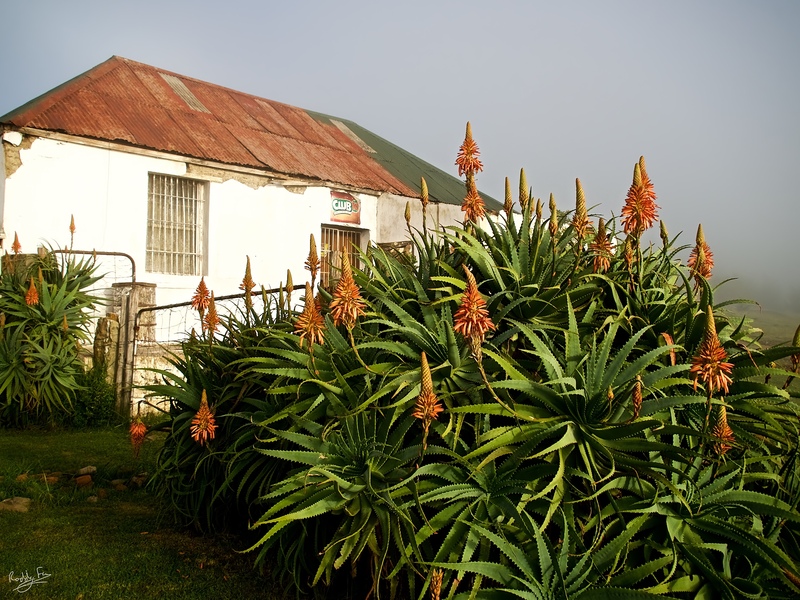 The backpackers is on the site of an old Transkei border trading post so it was surrounded by big banks of krantz aloes. They were already beginning to flower and during the day attracted beautiful malachite sunbirds. This morning, though, the mist gave an unusual backdrop for a photo shoot of the spider webs. Unusual because there’s no background to the pictures I shot. I was on the hillside looking down into the mist and far below you could just make out the bridge over the river. In the distance was the muted roar of the big waterfall. In the foreground spiders’ webs arched gracefully between the conical aloe flowers. Further down the bank, beside the drainage ditch, there were entanglements of cosmos. Most of the flowers were gone and the spiders had made delicate webs between the dead heads remaining. Once the sun had come out I took a walk down the valley and went behind the waterfall. 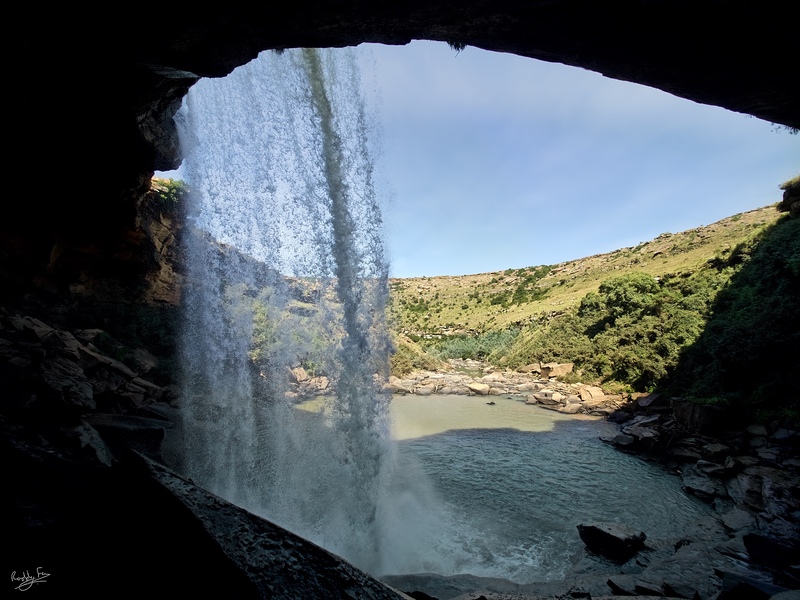 A short scramble through the rocks below and you get a fantastic swim in the pool wreathed in clouds of spray from the falls. A stunning place to visit.